In Dutch oven, combine beans and 2 quarts (8 cups) of the water. Cover; soak at room temperature for at least 8 hours or overnight. Drain beans, discarding liquid. In same Dutch oven, combine beans and remaining 2 quarts water. Bring to a boil over high heat. Reduce heat; simmer 1 hour or until beans are tender. Heat oven to 300°F. Spray 3-quart casserole with nonstick cooking spray. Drain beans, reserving 3 cups of the liquid. In large bowl, combine reserved 3 cups bean liquid, bell pepper, bacon, onion, salt, mustard, pepper and molasses; mix well. Pour into sprayed casserole. Cover. Bake at 300°F. for 4 hours, adding up to an additional 1 cup water as needed. Remove from oven. Uncover; arrange franks over beans. Return to oven; bake, uncovered, an additional 20 to 30 minutes or until franks are thoroughly heated. Boston baked beans is a classic New England recipe that blends the sweetness of molasses with the richness of salt pork. 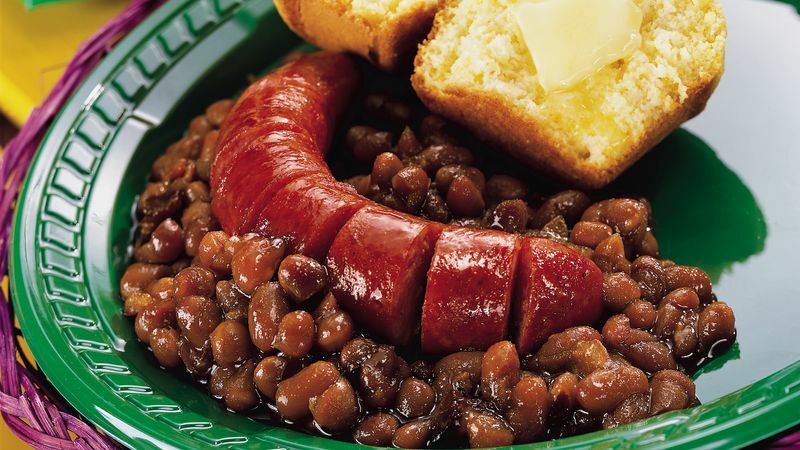 In Puritan times, navy beans and pea beans were combined with brown sugar, molasses and salt pork. The casserole was baked for hours on Saturday, in quantities large enough to serve Saturday night as well as on Sunday, when cooking was not permitted. This casserole is made with frankfurters, a popular modern addition to the original recipe. Bacon gives the dish a smoky flavor.